that is excelent stuff, u have posted here. I have only one clarification here. How the max angle and min angle are used in ur code. Thanks! And good question. Actually, they’re not in this implementation (even though I mention them at the beginning), but to include them is just a matter of introducing a set of inequality constraints into the scipy optimization call. To do that is just a matter of introducing another term into the optimization call, like the eqcons parameter, but this one is called ieqcons. If you just create two functions then, one that checks to make sure that the joint angles are above the lower bound, and one that checks to make sure the joint angles are below the upper bound (and set them up such that when this is true both of these functions return positive values), then you can just set ieqcons = [lower_constraint, upperconstraint], and you should be good to go! If you wanted to go further, you could also introduce distance to min / max joint angles into the cost function. The standard way is to set it up as an exponential that is pretty much zero for most values but then when you start getting close to the edge the cost starts shooting way way up. What if i use bound in optimization call. I really dont know. Bounds would work too! And be simpler to implement. The ieqcons parameter is more appropriate then when you’re wanting to restrict the values of some function of the state variables. For this straightforward constraint on variable range, I think you’re right, using the bounds parameter is the better way to go about it. Maybe this can be of use for someone testing your code. Thank you very much! I’ve updated the code, thanks for catching this! Tried for hours to make the example run. Spent a lot of time with making numpy available and finally found Anaconda so it worked out OK.
Hopefully it will work smoothly for you now! What does xy=xy mean and what does it do? (I changed xy =xy to just xy and nothing happened when I reran the code). glad you found it useful! that bit of code is Python specific, where you can specify parameters by name when you pass them into a method. The parameters don’t have to be called the same thing, though, we could have named the xy variable defined on line 83 xy_des, and then the line would be q = arm.inv_kin(xy=xy_des). It’s not necessary to pass parameters in by name, you can also pass them in in order, which is why you can remove the xy= part and it still works. Hope that clarifies! Thanks for the nice example! self.min_angles. Shouldn’t these be passed as a bounds argument to fmin_slsqp ? You’re totally right! Must have slipped my mind when I was writing it. I’ve added in the joint angle constraints to the code now such that the shoulder can’t move past pi / 2 so you can see the results when you run it. Thanks for the spot! Hi, thank you for this very clear and well written article. I ran into a problem while trying to execute your code. The following error appears: ModuleNotFoundError: No module named ‘future.utils’ . Do you have any idea how I could solve this? Hm! I haven’t seen this problem before, and I just checked the program runs fine for me in Python 3 on Ubuntu…it might be worth trying a clean Anaconda install (https://www.continuum.io/downloads) with Python 3 and trying again. Sorry I don’t have more thoughts on it than that! Thanks for your quick reply! I am working on windows though, that might be the cause ? I’ll try the clean install too. I ran your files as well as tried many cases but still can not reproduce the total error as small as yours. Can you give me your set of parameters to obtain that very small total errors. Do you have any “trial and error” strategy in picking up parameters? Hmmm, what version Python are you using? This works for me fine using an Anaconda (https://www.anaconda.com/download/) install of Python 3.5. Could you test that out and let me know if you’re still getting errors? Hi, thanks for this example! I was wondering if you could clarify the physical directions of the x and y planes in this context and why don’t use a z coordinate. Hi, Travis! Great article and great help. Your code works fine for this case, but I’m wondering what should I do if i want to add a Z coordinate to the movement? 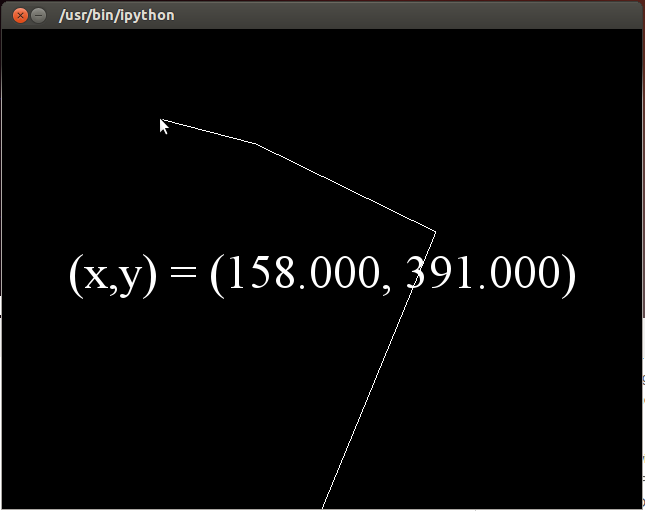 and y = np.arange(0.5, 2, .5), at the final trial all the returns are [NaN], the numpy Not a Number label. I’m not 100% on my recall, but I believe the lengths are set in terms of pixels for PyGame. So there’s no direct mapping to metres, cm, or mm. The relative scaling between them is what’s more important, the specific numbers I chose just so it would show up to be a good-ish length when visualizing. 🙂 Does that answer your question?